A top Iranian official has claimed a "great victory" over the US after the UN said it would not punish Iran's nuclear activities with sanctions. 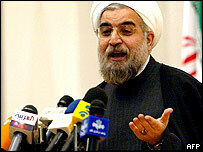 Hassan Rohani said Iran would never give up its right to nuclear power. He stressed during talks with European countries Iran's freeze on uranium enrichment was only temporary. The UN atomic agency IAEA welcomed Iran's offer to freeze enrichment in a statement on Monday that did not mention any threat of future sanctions. US President George W Bush has acknowledged Iran's latest move, but says the US wants the enrichment programme terminated, not just suspended. At a press conference in Canada where he is on an official visit, Mr Bush described the freeze as "a positive step, but it is certainly not the final step". Washington has accused Iran of going back on numerous promises over its nuclear activities, and had been pushing for UN sanctions. For his part, Mr Rohani said the "whole world had turned down America's calls". "We have proved that, in an international institution, we are capable of isolating the US. And that is a great victory," said Mr Rohani, who heads Iran's top security body. He added that the US representative at the IAEA meeting in Vienna "was enraged and in tears, and everybody said that the Americans had failed and we had won". It was Iran's first direct comment on the nuclear controversy since the IAEA resolution on Monday. According to Mr Rohani, Iran's offer to suspend uranium enrichment would only apply for the duration of talks with the EU. "We are talking months, not years," the cleric said. Officials from the UK, Germany and France are trying to get Iran to renounce its nuclear fuel enrichment programme for good. BBC correspondent Frances Harrison says Iran is hoping to be able to offer Europe objective guarantees to prove it is not diverting nuclear material for a secret weapons programme. Talks between the Europeans and the Iranians are due to resume on 15 December. Mr Rohani said "the length of negotiations must be rational and not too long". But, he added, the talks were a "historical opportunity for Iran and Europe to prove to the world that unilateralism is condemned". Iran maintains that its nuclear programme is solely for peaceful purposes and rejects accusations that it is working towards technology which could eventually be used for the production of nuclear weapons.